Living annuities have a long and colourful history in the South African financial services industry. After initially being touted in the late 90s as the solution for pensioners facing an environment of falling bond yields and increasingly expensive guaranteed life annuities, living annuities attracted media and regulator attention again around the time of the 2008 financial crisis. This was not surprising because living annuities increasingly reflected the sad reality that many South Africans don’t contribute nearly enough to their retirement savings throughout their lives. Pensioners with inadequate retirement savings typically draw too much income from their living annuity, setting them on a course to run out of income later on in retirement. More recently, living annuities were again in the spotlight as three years of depressed South African investment markets meant that most living annuity pensioners were drawing income in excess of the investment return they had achieved, thereby temporarily eating into their annuities’ capital. This unfortunate situation, while not unexpected at all, has further increased many pensioners’ and financial advisors’ anxiety about the future. It is against this background that Investec Asset Management commissioned in-house research on some of the key talking points regarding living annuities. The research focused on various portfolio construction, asset allocation and income revision strategies which were tested with an in-house model using index asset class returns over the past 118 years. The annual income review of a living annuity is crucial to the longevity of the annuity. Allowing the annual income increases to fluctuate in accordance with the annuity’s investment returns, dramatically improves the annuity’s longevity. And conversely, increasing a living annuity’s income payment every year with inflation, irrespective of the investment performance achieved over that year, is a poor income strategy. Living annuities need a strong equity growth engine which includes solid exposures to domestic and offshore equities. For incomes around 4% or higher, a living annuity requires at least 60% invested in such a growth engine. This outcome challenges the commonly held belief that a 40% equity exposure is optimal for most living annuity portfolios. Volatility is a critical tool in deciphering the living annuity investment puzzle – not just real returns. Active management can impact investor outcomes significantly. While active managers have been considered for their outperformance levels, i.e. returns above the index, their ability to achieve better risk characteristics is typically not taken into account. We will expand on the first two findings in future articles. The remainder of this article focuses on the last two points: The importance of volatility for income-generating portfolios, and the role of active management. Modern portfolio theory and the efficient frontier have for many years defined how we construct optimised portfolios for clients. The theory has been widely used, together with the now familiar risk/ return scatterplots, to evaluate various portfolio investment options against one another. All income and dividends reinvested. Figure 1 highlights how, even if we keep investment returns and income drawdowns exactly the same, increasing the portfolio volatility from 9% to 15% raises the risk of a living annuity failing over a 30-year period almost threefold. We then examined the relationship between real return, volatility and sustainable income levels using our in-house living annuity modelling tool. The conclusions were somewhat surprising. For every 1% reduction in the level of volatility of the investment portfolio’s real returns, the pensioner could receive an additional 0.3% p.a. of sustainable income. The second point highlights a key fact – volatility is very important to income investors, and can now be quantified in terms of its impact on sustainable incomes. Determining the impact of volatility also enables us to quantify the value added by an active manager who is able to produce lower risk portfolios without sacrificing real return potential. Now that we have confirmed the importance of portfolio volatility to living annuity investors, we can turn our attention to the next question: Can active asset managers sustainably achieve market-related real returns at lower-than-market levels of portfolio volatility? Over the past ten years we have seen a growing body of research that examines the relative risks and returns of various recognised portfolio management styles. 3 This research indicates that an investment style such as Quality (relative to say Value, Growth or Momentum-biased styles) appears to produce portfolios with lower long-term volatility without sacrificing the potential for long-term real returns. Investec Asset Management has two funds in the Multi-Asset High Equity sector, each with a distinct investment philosophy and style. The Investec Opportunity Fund follows a Quality investment style, while the Investec Managed Fund’s Earnings Revision style focuses on capturing trends in earnings growth expectations. Both these funds have a 20-year track record. Modelling is done in real terms (i.e. in today’s money terms) and covers the 20-year period from 31 December 1997 to 31 December 2017, using the respective fund fee classes available at the inception date. Source: Morningstar, as at 31.12.17. Monthly returns are used as input into an in-house living annuity modelling tool that calculates the future annuity fund values in real terms. Investment performance is for illustrative purposes only to show the volatility impact. The returns are based on the combination of class A and R performance which were the most expensive classes over the period. 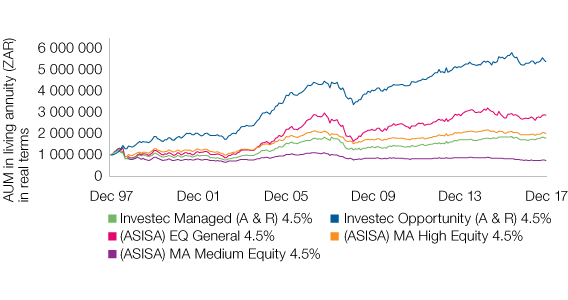 Figure 2 shows that the Investec Opportunity Fund fared substantially better than the three ASISA sector averages. This result is not entirely surprising as the Investec Opportunity Fund outperformed the ASISA Multi-Asset High Equity sector average by 4.4% p.a. over the period highlighted in the graph (31 December 1997 to 31 December 2017). What is interesting though is that, when we compare the portfolio end values for the living annuities invested in the Investec Opportunity Fund and the ASISA Multi-Asset High Equity sector average, the Investec Opportunity Fund living annuity portfolio beat the sector average living annuity portfolio by 5.5% p.a. Why did the Opportunity Fund living annuity portfolio outperform its ASISA sector average by 5.5% p.a. when the fund itself (based on an initial lump sum investment) only outperformed the sector average by 4.4% p.a.? The answer lies in the fund’s lower volatility signature. 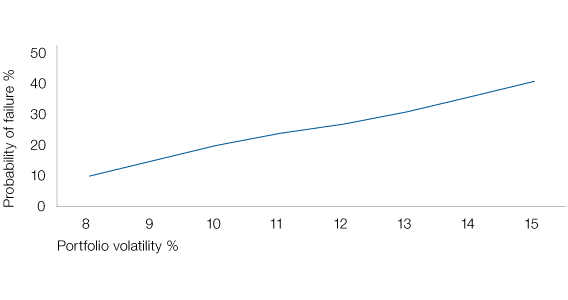 Over the measured 20-year period, the Investec Opportunity Fund had an annual volatility of approximately 1% p.a. less than the Multi-Asset High Equity sector average. The Investec Managed Fund, on the other hand, outperformed the ASISA Multi-Asset High Equity sector by 0.2% p.a. over the 20-year period (based on an initial lump sum investment). Yet in Figure 2, above, the Investec Managed Fund living annuity had a lower end value than the sector average annuity. The reason is that the Investec Managed Fund had an annualised volatility that was approximately 1.2% p.a. higher than the sector average over the 20-year period. The experience with the Investec Managed Fund is a good example of how a fund with a higher volatility signature fares in a living annuity. A lack of retirement savings remains a serious problem in South Africa. No living annuity is going to be the solution for an investor who hasn’t saved enough for their retirement. Furthermore, unpredictable markets require careful attention due to the challenges they pose to pensioners. Our research has shown that portfolio volatility, often treated as substantially less important than investment returns, matters a lot for living annuity investors. In fact, higher portfolio volatility in an income-producing portfolio acts as a drain on portfolio performance. Conversely, lower volatility seems to ‘create’ additional returns for an income-producing portfolio because it helps the portfolio manage sequence-of-return risk more effectively. We believe that it therefore makes sense for investors and advisors to consider investment strategies with an inherent lower volatility for income-producing portfolios such as living annuities. Investment strategies that can deliver both strong long-term real returns together with lower volatility can have a big positive impact on these portfolios. 1This describes a phenomenon whereby an income-producing portfolio is much more sensitive to poor investment returns at the inception of the investment, than to poor investment returns towards the end of the investment term. 2This is to be expected. Every 1% portfolio return should produce approximately 1% of additional income – around 0.1% of sustainable income seems to get lost through time value of money and the fact that incomes are reviewed only once a year. 3See “An Investor’s guide to Understanding the impact of ‘Quality’ on portfolio performance” by The Third Dimension, March 2010. This Viewpoint details Investec Asset Management’s (Investec’s) research findings on the importance of volatility for income-generating portfolios, and the role of active management. The information presented here is not intended to be relied upon as investment advice. Various assumptions were made. There is no guarantee that views and opinions expressed will be correct. The findings expressed here may not reflect the views of Investec as a whole, and different views may be expressed based on different investment objectives. Investec has prepared this communication based on internally developed data, public and third party sources. Although we believe the information obtained from public and third party sources to be reliable, we have not independently verified it, and we cannot guarantee its accuracy or completeness. Investec does not provide any financial advice. Prospective investors should consult their financial advisors before making related investment decisions. Collective investment scheme funds are generally medium to long-term investments and the manager, Investec Fund Managers SA (RF) (Pty) Ltd, gives no guarantee with respect to the capital or the return of the fund. Past performance is not necessarily a guide to future performance. The value of participatory interests (units) may go down as well as up. Funds are traded at ruling prices and can engage in borrowing and scrip lending. The fund may borrow up to 10% of fund net asset value to bridge insufficient liquidity. A schedule of charges, fees and advisor fees is available on request from the Manager which is registered under the Collective Investment Schemes Control Act. Performance shown is that of the fund and individual investor performance may differ as a result of initial fees, actual investment date, date of any subsequent reinvestment and any dividend withholding tax. Fluctuations or movements in exchange rates may cause the value of underlying international investments to go up or down. Where the fund invests in the units of foreign collective investment schemes, these may levy additional charges which are included in the relevant Total Expense Ratio (TER). Investec Asset Management (Pty) Ltd is a member of the Association for Savings and Investment SA (ASISA). This is the copyright of Investec and its contents may not be re-used without Investec’s prior permission. Investec Asset Management is an authorised financial services provider. Issued, May 2018.